Foggy Sunrise at the Barn | Just Shooting Memories! I began using Linux several years ago when I attempted to re-install windows on my desktop. However, I have not had my desktop up and running for about a year now, but I changed that last night. Along with my new Windows install, I tackled an install of Ubuntu 11.04. What a cool operating system. I just wish I could get Photomatix on it. Maybe I will try to figure it out or if one of you have, let me know. I took this photo a while back and just now had the time to process it. It has been a bear and I still am not all that happy with it. With the days getting shorter and school back in full swing, I have not had the sunrise experiences that I got this summer. I will have to begin making specially sunrise trips on the weekend to get the same experiences. Don’t miss another shot I took of this Barn. 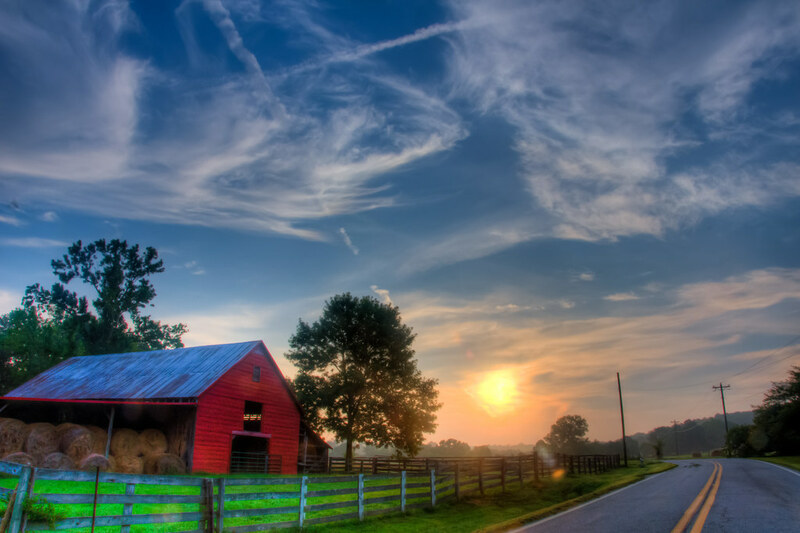 Very nice photo; colors, composition, clouds and more. I have an old laptop I’m thinking of installing Ubuntu on for the kids, hoping it might run the browser faster. Tim, you can get some of the lighter distributions which should. I don’t know if the most recent version of Ubuntu is good on older hardware. But, for free…who cares…try it anyway. Good Luck.